After some nice water last Saturday, I was expecting some reasonable catches but I’m afraid it was rather slow with only six fish landed for the week. Water levels were above 15 till Thursday which although low is enough to bring fish. Most fisheries seem to have a similar story at the moment with a few exceptions. There were grilse seen here during the week but they were less than co-operative. Conor Hannon had the first fish of the week on Monday, a sea liced 3lbs2ozs fish from the grilse pool on a Cascade. Sean Dempsey managed to land two on Tuesday. The first was 6lbs12ozs on a Beaded Nymph from the Turn pool and the second a 2lbs fish from the Bridge pool on a Delphi Collie. 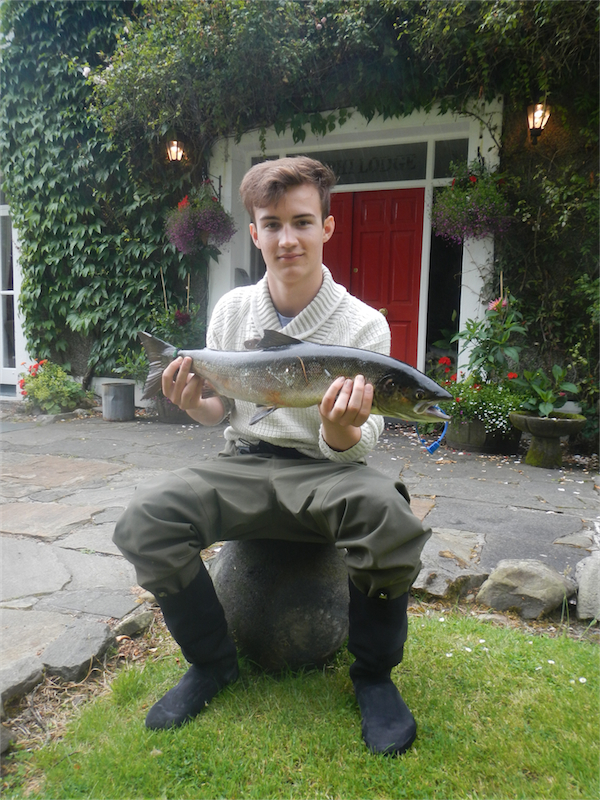 On Wednesday Nick Kreissl managed to land his first ever salmon on the fly from Salmon City on Finlough. The fish weighed in at 6lbs1oz and was taken on a Yellow Allie. That evening Sean Dempsey landed a sea liced fish of approx. 14lbs from the Turn pool on a Dempsey nymph. On Thursday, whilst fishing with Roger Kenny, Sean Dempsey again, with the expert help of Roger, managed to land a 9lbs fish from Salmon City on Finlough on Jungle Bunny Bibio. On a positive note there appear to be some good sea trout arriving and there were some landed during the week, although nobody has specifically targeted them yet. 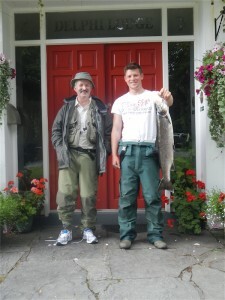 That may change this week as we have some old time sea trout anglers fishing with us. So it will be interesting to see what sea trout catches are like this week. We have had some light rain today and the river having fallen to 10 yesterday is now running at 25 and with more forecast for Monday I would be hopeful of more Grilse showing up in the system.